Herald editor Joram Nyathi has been fired, NewZimbabwe.com reports. Herald editor Joram Nyathi has been fired, NewZimbabwe.com gathered early Wednesday morning. Nyathi apparently fell victim to the turf war between the ministry of information and the presidential communications department. NewZimbabwe.com was further told that the development is also linked to the broader factional rivalry between President Emmerson Mnangagwa and deputy Constantino Chwenga. The remark was thought to suggest that he may have been suspended, but sources told NewsZimbabwe.com he had been fired with deputy Tichaona Zindoga taking over, at least, overnight. Although Zimpapers is a private company listed on the Zimbabwe stock exchange (ZSE), government is the majority shareholder. This allows the Zanu PF-led administration to influence editorial policy, as well as hire and fire senior staff. Mnangagwa loyalist Mayor Justice Wadyajena had warned earlier Tuesday that all was not well at Herald House. According to the Zanu PF legislator, there was royal anger after an article about the president's return home from Eurasia was relegated to Page 2. 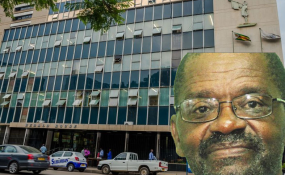 Nyathi was only appointed Herald editor on December 18 last year, taking over from Caesar Zvayi. The editorial changes - believed to have been spearheaded by new information minister Monica Mutsvangwa - also saw Mabasa Sasa being replaced as Sunday Mail Editor. Sasa and Zvayi are proteges of former information ministry permanent secretary George Charamba who is now President Emmerson Mnangagwa's chief spokesman. The presidential spokesman was understood to have opposed the editorial changes. And he now appears to have hit back.